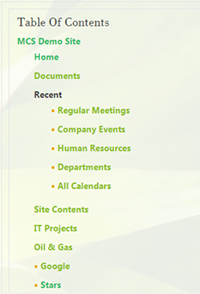 SharePoint’s Table of Contents web part can quickly show you a list of all the people, pages, and sub-sites on your site. It’s a fast way to create a directory for easier navigation. You can find the Table of Contents web part under the Content Rollup Category. Besides the normal options for changing the appearance of the web part, you can also change the location from which the table of contents starts and the number of levels shown. 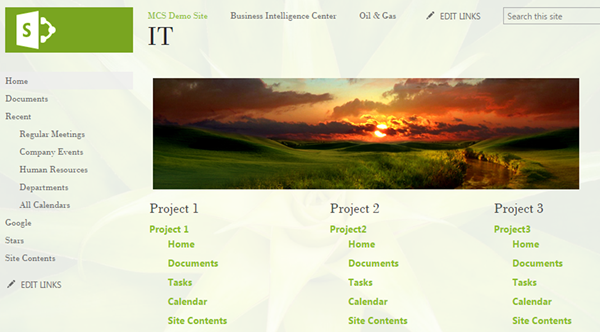 For example, a company’s IT projects site may have several sub sites for each of their projects. Quickly navigate to the contents of sub site, by adding a table of contents starting at the level to the project portfolio site. One big advantage of the table of contents web part over creating your own list of links is that tables of contents are automatically updated. If you add content (new web parts), the table of contents will immediately update to show that content. This could also be a disadvantage if you do not want this new content to show. The table of contents also updates as web parts are removed from the site, preventing broken links. Careful automation is more sustainable then diligent manual updates.